All right, so I’m not the world’s best photographer, especially with my non-smart phone. These nuts are easy and fast, with a surprising kick. The recipe originally came from the Better Homes and Gardens website, but I can never find it there, so here it is for posterity. Consider yourself warned — these are addictive. Preheat oven to 350. Place nuts on a jelly roll pan and toast for about 20 min., stirring occasionally. Meanwhile, mix remaining ingredients. 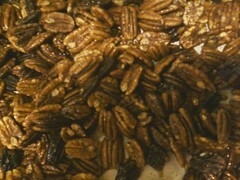 When nuts are done, remove from oven and drizzle mixture over nuts tossing until they are well coated. Spread in a single layer and cool on a wire rack. Store at room temperature for up to a month in a tightly sealed container. Makes 2 cups. 1/4 cup has 210 calories, 4 g. protein, 9 g. carbohydrates, 19 g. fat, 0 mg. cholesterol, 80 mg. sodium. This entry was posted in Uncategorized and tagged Christmas note, Easy recipe, Easy snack, Hot Spicy Toasted Nuts, recipe. Bookmark the permalink.